We’re always being asked for recommendations for family-friendly restaurants in Cornwall, and our previous blog Top Ten Cornish Restaurants…for Kids is one of our most popular. Here are another ten well-tested restaurants where you and your children can all enjoy fabulous food. After exploring the Shipwreck Museum and admiring the old ships in the historic port of Charlestown, the whole family will love the friendly atmosphere at The Longstore. While the children tuck into super fresh fish, and fun ice cream sundaes, parents will find it difficult to decide which of the delicious seafood and steak dishes to choose. Read our review here. You can’t go wrong with a trip to Gilmore’s, with its very own crazy golf course, guaranteed to keep everyone entertained. The café specialises in tacos and burritos; children can build their own taco, or order quesadillas or mini fish and chips. The milkshakes are pretty good too. When the kids start to get restless, send them off for a round of mini golf, while you put your feet up with a cocktail. Read our review here. The popular restaurant at The Beach at Bude not only serves beautiful food for grown ups, but the children’s menu is great too. Kids can choose from dishes such as roast pork belly with crackling, a cheeseburger in a brioche bap with coleslaw and fries, and pasta with cauliflower cheese sauce with toasted hazelnuts. There is also a daily changing, good value, set lunch menu, and two gorgeous family suites should you wish to stay a night or two. Read our review here. 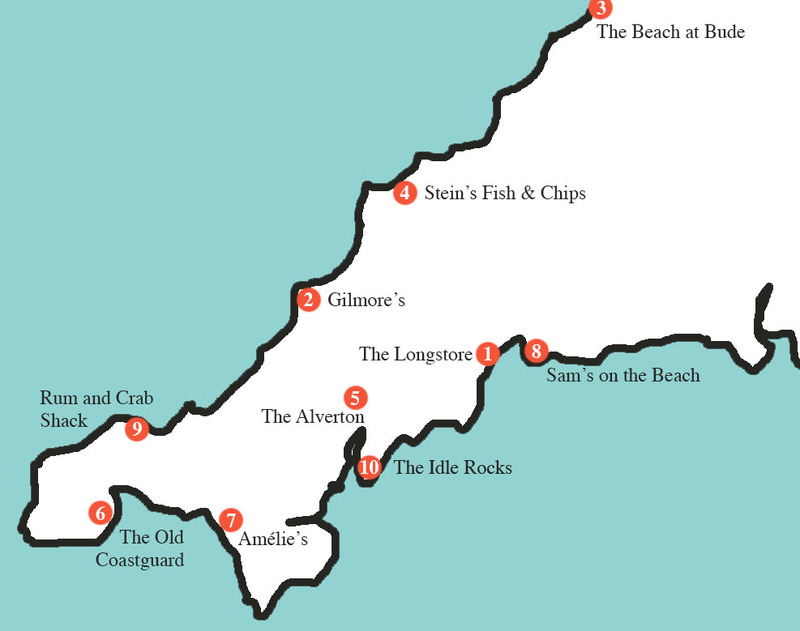 Cornwall abounds with fish and chips shops, but Stein’s Fish and Chips in Padstow serves some of the best we’ve tasted. You can choose if your fish is grilled, or battered and fried in proper beef dripping. Children’s portions of cod bites, goujons or scampi are generous, and puddings are delicious too. You can choose to eat in, or take away your food to enjoy outside, but beware the seagulls! The historic Alverton Hotel sits just up the road from Truro cathedral, and is a great spot to escape the hustle and bustle of the city centre. The garden is beautiful, parking is free, and food is good. As well as a kids’ menu, there is also a children’s afternoon tea, with little sandwiches and homemade cakes. Read our review here. This seaside hotel in Mousehole has a large garden, perfect for little ones to run around in if they’re fed up with sitting still. The Old Coastguard‘s menu features fantastic fish and has a strong emphasis on local, seasonal produce, cooked in a modern British style. There are both toddlers’ and children’s menus, including child-friendly but grown up dishes such as Cheddar rarebit, smoked salmon with dressed leaves, and fish of the day with new potatoes, spinach and lemon. Restaurant owner Sam Sheffield-Dunstan’s daughter Amélie helped create their children’s menu, which is a delight. There are mini bowls of olives and crispy squid amongst the starters; main courses include mussels, pasta, and wood-fired pizzas. Grown ups can enjoy delicious fish, steak and pizzas, all cooked in the wood-fired oven, as well as a nice range of seafood tapas dishes. Sam’s on the Beach is the kind of place which will stick in children’s memories. The menu is good – wood-fired pizzas, mussels and pasta – but it’s the location, right on the beach, which makes it so special. Kids can break from their meal to build a sandcastle, then run back to the table to share the supersize ice cream sundae, packed with brownies, flakes and marshmallows. Read our review here. Not only will parents enjoy the huge range of crab dishes at the Rum and Crab Shack (and perhaps a drop or two of rum), children will love a bowl of crab claws, ready to break apart and prise out the sweet crab meat. The menu also includes mac ‘n’ cheese, popcorn chicken, corn on the cob, and waffles for pud. Treat your children to a rather grown up experience at the Idle Rocks in St Mawes. The setting, service and food here are faultless, and though the children’s menu is simple (e..g spag bol or sausage and mash) it is very good. Read our review here. 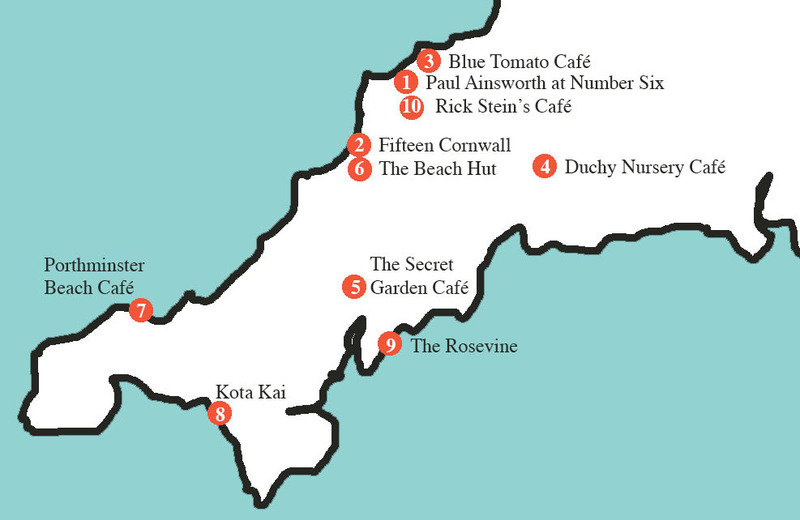 Our previous blog – Top Ten Cornish Restaurants…for Kids – contains the restaurants shown on the map below. CATCH IT. COOK IT. EAT IT.